As an important component of Chinese traditional culture, the I Ching's influence throughout history has been profound. The I Ching (Yì Jīng), or Classic of Changes, which dates from over 3,000 years ago, is believed to be one of the world's oldest books. The two major branches of Chinese philosophy, Confucianism and Taoism have common roots in the I Ching. From its mythological origins in prehistory (see Fu Xi) and the earliest dates of recorded history in China, the I Ching has been added to by a succession of philosophers, scholars and rulers. Thus, it reflects a thread of thinking and a common cosmology that have been passed through successive generations. In addition to the I Ching's broadly recognized influence on Confucianism and Taoism, it has been shown to have influenced Chinese Buddhism. Fazang, patriarch of the Huayan school, is believed to have drawn on a mode of thought derived from the I Ching. 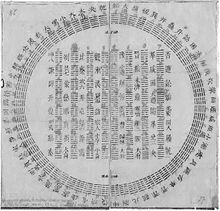 One of the earliest versions of the I Ching (called, Zhou I, or Changes of Zhou) was the oracle of the Zhou. It played a role in their overthrow of the Shang dynasty by Zhou King Wu in 1070 BCE. An account of Wu's conquest tells of a solar eclipse believed by the King to be an omen from Heaven to march against the Shang. This account has been matched with a solar eclipse that occurred on June 20, 1070 BCE. Thus, the earliest layer of the I Ching has been shown to preserve a hidden history that went undetected for three millennia. The Zhou Yi has been called one of the most important sources of Chinese culture. It has influenced fields as varied as mathematics, science, medicine, martial arts, philosophy, history, literature, art, ethics, military affairs and religion. Joseph Campbell describes the I Ching as "an encyclopedia of oracles, based on a mythic view of the universe that is fundamental to all Chinese thought." Confucius was fascinated by the I Ching and kept a copy in the form of "a set of bamboo tablets fastened by a leather thong, [which] was consulted so often that the binding had to be replaced three times. [Confucius] said that if he had fifty years to spare, he would devote them to the I Ching." The ten commentaries of Confucius, (or Ten Wings), transformed the I Ching from a divination text into a "philosophical masterpiece". It has influenced Confucians and other philosophers and scientists ever since. Prior to the Tokugawa period (1603–1868 CE) in Japan, the Book of Changes was little known and used mostly for divination until Buddhist monks popularized the Chinese classic for its philosophical, cultural and political merits in other literate groups such as the samurai. The Hagakure, a collection of commentaries on the Way of the Warrior, cautions against mistaking it for a work of divination. German mathematician and philosopher Gottfried Wilhelm Leibniz was keenly interested in the I Ching, and translated I-Ching binary system into modern binary system. The philosopher and novelist Will Buckingham has used the I Ching extensively, describing it as an 'uncertainty machine'. The D&B-metal music group Marshall Ar.ts use the I Ching hexagram 36 in their logo and refers to it in several songs. In a 1965 interview, Bob Dylan stated that the book is "the only thing that is amazingly true, period…besides being a great book to believe in, it’s also very fantastic poetry" and in a mid-1970s rendition of his song Idiot Wind he sang "I threw the I-Ching yesterday, it said there might be some thunder at the well." The film G.I. Joe: The Rise of Cobra uses a red hexagram tattoo on the right forearm for the Storm Shadow ninja clan. The poet Allen Ginsberg wrote a poem called Consulting I Ching Smoking Pot Listening to the Fugs Sing Blak in 1966. Author Hermann Hesse's 1943 novel The Glass Bead Game is mainly concerned with the principles of the I Ching. Psychologist Carl Jung wrote a foreword to the Wilhelm–Baynes translation of the I Ching. Photek released a song called Book of Changes in 1994. The writer Raymond Queneau had a long-standing fascination with the I Ching. I Ching is mentioned in the Monty Python song I Like Chinese, written by Eric Idle. The I Ching is mentioned in Charmed S5E22 'Oh My Goddess (Part 1)'. ^ Wilhelm, Richard; Baynes, Cary F.; Carl Jung; Hellmut Wilhelm (1967). The I Ching or Book of Changes. Bollingen Series XIX (3 ed.). Princeton, NJ: Princeton University Press (1st ed. 1950). ISBN 0-691-09750-X. Retrieved 8 June 2010. ^ Wilhelm, Richard; Baynes, Cary F. (5 December 2005). Dan Baruth (ed.). "Introduction to the I Ching". Retrieved 8 June 2010. ^ a b Perkins, Franklin. Leibniz and China: A Commerce of Light. Cambridge: Cambridge University Press, 2004. p 117. Print. ^ Lai, Whalen (1980). "The I-ching and the Formation of the Hua-yen Philosophy". Journal of Chinese Philosophy. D. Reidel Publishing. 7 (3): 245–258. doi:10.1111/j.1540-6253.1980.tb00239.x. Retrieved 12 February 2006. ^ Marshall, S.J. (August 2002). The Mandate of Heaven: Hidden History in the I Ching. Columbia University Press. p. 50. ISBN 978-0-231-12299-3. Retrieved 8 June 2010. ^ Campbell, Joseph (12 April 1962). The masks of God: Oriental mythology. Viking Press. p. 411. Retrieved 8 June 2010. ^ Needham, J. (1991). Science and Civilisation in China: Volume 2, History of Scientific Thought. Cambridge University Press. p. 307. ISBN 978-0-521-05800-1. ^ a b Abraham, Ralph H. (1999). "Chapter 1. Legendary History of the I Ching". Retrieved 15 February 2008. ^ Wai-ming Ng (2000). The I ching in Tokugawa thought and culture. University of Hawaii Press. pp. 6–7. ISBN 978-0-8248-2242-2. Retrieved 6 June 2010. ^ Yamamoto Tsunetomo; William Scott Wilson (trans.) (21 November 2002). Hagakure: the book of the samurai. Kodansha International. p. 144. ISBN 978-4-7700-2916-4. Retrieved 6 June 2010. ^ a b Nylan, Michael (2001). The Five "Confucian" Classics. Yale University Press. pp. 204–206. ISBN 978-0-300-08185-5. Retrieved 8 June 2010. ^ Douglas Adams (1991). The Long Dark Tea-Time of the Soul. Simon and Schuster. p. 97. ISBN 978-0-671-74251-5. Retrieved 8 June 2010. It was much like an ordinary pocket calculator, except that the LCD screen was a little larger than usual in order to accommodate the abridged judgments of King Wen on each of the sixty-four hexagrams, and also the commentaries of his son, the Duke of Chou, on each of the lines of each hexagram. These were unusual text to see marching across the display of a pocket calculator, particularly as they had been translated from the Chinese via the Japanese and seemed to have enjoyed many adventures on the way. ^ I.G. Bearden (17 May 2010). "Bohr family crest". Niels Bohr Institute (University of Copenhagen). Retrieved 7 June 2010. ^ Buckingham, Will. "The uncertainty machine". Aeon Magazine. Retrieved 17 August 2014. ^ Cannella, Cara. "Celebrating the Ancient Wisdom of the I-Ching at Beijing's Water Cube". Biographile. Retrieved 17 August 2014. ^ "Consulting I Ching Smoking Pot Listening To The Fugs Sing Blake (Broadside Poem)". Abebooks. Retrieved 17 August 2014. ^ "Studio Pressure – Form & Function Vol. 2". Discogs. Retrieved 19 August 2014. ^ Smith, Richard J. (2012). The "I Ching": A Biography. Princeton University Press. p. 200. ISBN 1400841623. Retrieved 17 August 2014. ^ Saad, Ezechiel (1989). Yi King, mythe et histoire. Paris: Sophora. ISBN 2-907927-00-0. This page was last edited on 25 December 2017, at 09:47 (UTC).